Leroy Boatwright with his children at the renaming ceremony. From left: Laura Smith (BSPH 80), Leroy Boatwright (BSPH 49), Emily Provence (BSPH 83) and Steven Boatwright (BSPH 88). 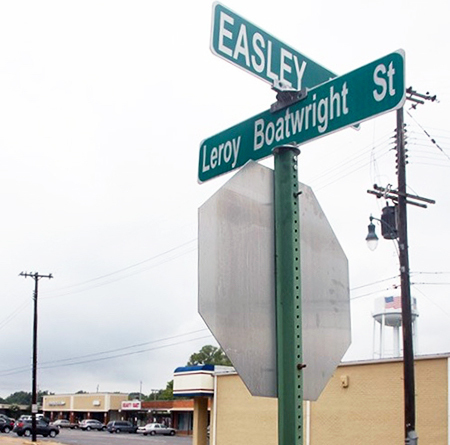 For the few people in Millington, Tennessee, who don’t know where Boatwright Pharmacy is, Leroy Boatwright (BSPH 49) can now give them directions using his own name. 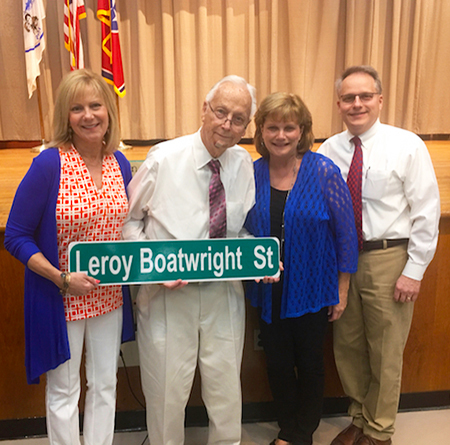 Friends of Boatwright’s from the Millington Senior Citizen Group secretly organized the campaign to rename the street. Meanwhile, his son Steven Boatwright (BSPH 88), his father’s successor at Boatwright Pharmacy, made sure his family would be in town for the renaming ceremony in mid-August. As part of the ceremony, the mayor of Millington, Terry Jones, and members of the Board of Aldermen, spoke about Boatwright’s impact on the community. They presented Boatwright with gifts, a key to the city and a proclamation declaring the street name changed. The new sign was installed down the road from Boatwright Pharmacy. Photo courtesy of the Millington Star. All of Boatwright’s three children are pharmacists and graduates of the Ole Miss School of Pharmacy, including Emily Provence (BSPH 83). Provence and her husband Bradley (BSCHE 82) are both involved in Boatwright Pharmacy. Smith and her husband Brent (BSPH 75) co-own Chaney’s Pharmacy in Oxford. Even though Boatwright is retired, he keeps his pharmacist’s license up-to-date and still comes into the store from time to time and speak with customers and help patients. Leroy Boatwright said he was very surprised by the honor and grateful to his family, friends and the city. For more information on the School of Pharmacy and this release, click HERE. Laura and Brent Smith; Emily and Bradley Provence; and Steven Boatwright are active members of the Ole Miss Alumni Association.